Interface fluctuations in different living and non-living models considered within the study: a) superposition of a unit cell of zinc imidazolate metal-organic framework observed at two time points (magnified view inset), b) thermal surface ripples on graphene over water, c) bright field image of an individual Physarum polycephalum (slime mold) to demonstrate active periodic vascular contractions from left to right, with time, d) schematic representation of a theoretical model to assess particle diffusion, transport is modified via advection, e) schematic representation of a two-dimensional geometry used in the main text to explain the theory. Credit: Nature Physics, doi: https://doi.org/10.1038/s41567-018-0239-0. Physicist Richard Feynman highlighted the importance of fluctuations in living matter when he stated, "Everything that living things do can be understood in terms of the jigglings and wigglings of atoms." 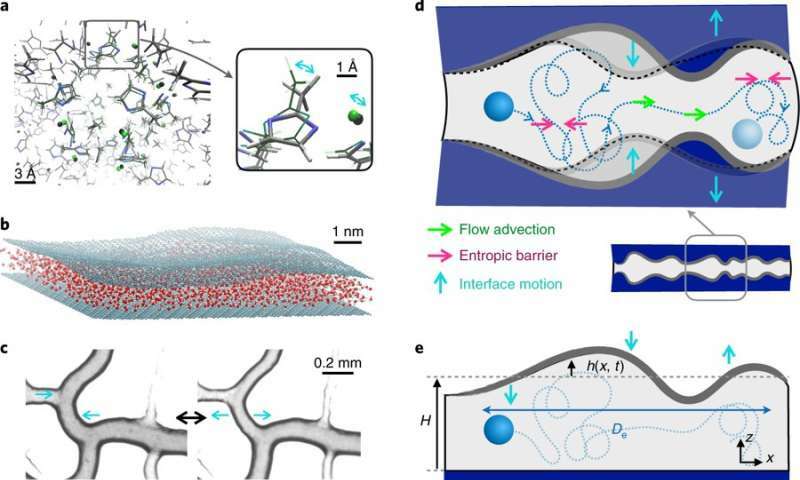 This holds true for the widely investigated transport driven by fluctuations in biological nanopores and for similar observations in non-living fluid phases, where bulk hydrodynamic fluctuations dramatically affect nanoscale dynamics. Numerical simulations have also highlighted the impact of phonon modes in carbon nanotubes transporting confined particles within them, and studies at larger scales have investigated microfluidic surface acoustic waves that manipulate fluids at the microscale. While these observations show the quantitative impact of surface agitation on transport properties spanning considerable length scales, a general theory that predicts the dependence of transport properties on surface fluctuations is lacking. Such potential to actively or passively control molecular transport through nanopores will impact biosensing applications. For instance, at present, it is surprisingly difficult to answer if pore surface fluctuations enhanced or diminished diffusive transport. While surface fluctuations are expected to enhance properties of diffusion through induced hydrodynamic flows, geometrical bulges may entrap particles for entropic slowing. As a result, the more general situation of transport with temporally varying geometry remains open. In response, writing in Nature Physics, Marbach et al. have now established a general relationship between diffusive transport and the dynamic spectrum of surface fluctuations. The framework applies to cases in which structural fluctuations of the confining pore are induced by thermal noise, and to active non-equilibrium fluctuations induced by external stimuli. The theory was applied to understand several situations relevant to nanopore transport and to larger-scale configurations such as active contractions in fungal species that influence nutrient transport. The findings demonstrated a complex interplay between transport and surface wiggling. The theory was in full agreement with simulations of molecular dynamics and with existing observations from literature. The results illuminated the impact of pore agitation in a broad range of artificial and biological porins and at larger scales in vascular motion of fungi, intestinal contractions and microfluidic surface waves, opening the possibility to actively tune the transport across membranes via external stimuli. Such phenomena have potential applications for controlled nanoscale pumping, osmosis and dynamic ultrafiltration across membranes. The theory began by analyzing diffusion of a particle confined between two fluctuating surfaces in a simple two-dimensional geometry, readily extendable to three dimensions. At first, the general theory applied to several scenarios, including fluctuations originating from thermal noise and active (non-equilibrium) fluctuations driven by external stimuli. In subsequent equations, the diffusion constant could be renormalized to be either positive or negative, since jiggling in the system could either speed things up or slow things down. Further scenarios were considered for situations in which the pore structure underwent non-equilibrium fluctuations due to an external stimulus by adding a force to an equation, leading to out-of-equilibrium transport within pores. 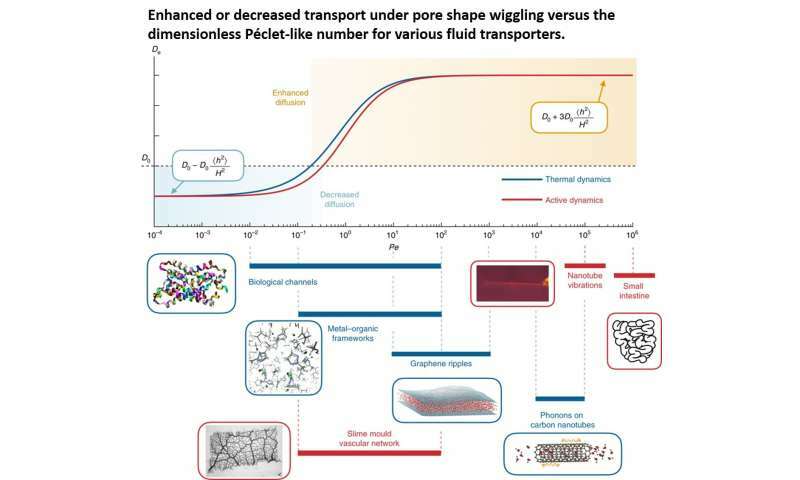 Enhanced or decreased transport under pore shape wiggling vs. the dimensionless Péclet-like number for various fluid transporter models, described in the study. Effective diffusion in thermally or actively fluctuating pores was re-normalized via thermal dynamics spectrum or via active dynamics as described in the study. Credit: Nature Physics, doi: https://doi.org/10.1038/s41567-018-0239-0. 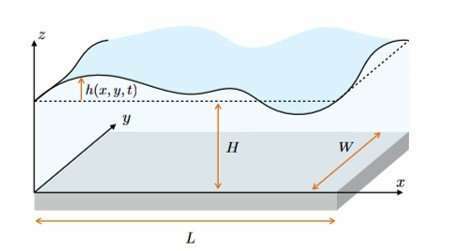 As an outcome of the theoretical framework, the physicists were able to quantify the impact of surface fluctuations on transport in the model systems considered in the study. Typically for high Péclet-like number (a dimensionless indicator of diffusion or advection in a system) the transport is expected to increase under structural jiggling through advection dominated distribution, as observed. Deriving the reduced advection-diffusion equation between a flat substrate and fluctuating upper surface. Schematic shows a fluctuating interface [z= h(x,y,t)] from a reference height H. The interface either constitutes a membrane or is a free layer. Credit: Nature Physics, doi: https://doi.org/10.1038/s41567-018-0239-0. The transport of molecules through biological membranes is a tightly regulated process, absolutely vital for living organisms. The paradigm can therefore be used in an organism of interest to understand the dynamics of nutrient dispersal within contracting vascular networks, since alternative strategies for fast nutrient dispersal is essential for survival. For example, in the unicellular P. polycephalum organism composed of a connected network of veins containing cytoplasm, nutrients can be delivered across the body through non-stationary periodic shuttle flows driven by a peristaltic wave of contractions spanning the organism. The study highlighted that a wide variety of situations covering a range of scales can be put in to perspective under the theorized framework. The theory will allow the identification of key components to design active channels. The results showed the possibility of actively tuning diffusion across nanopores. In addition, osmosis can be modified in fluctuating channels by harnessing out-of-equilibrium dynamics of the pore, for future exploration. Such fine-tuning capabilities will have significant applications in in-depth molecular studies in the future.